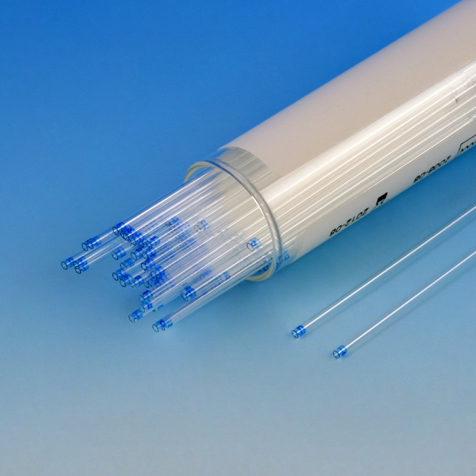 Our glass capillary tubes are designed for both safe blood collection as well as accurate micro-hematocrit determinations. Precision molded, they provide excellent sample retention during centrifugation. In addition, the tubes fill rapidly without affecting specimen integrity. The tubes are available plain or with an anticoagulant (sodium or ammonium heparin) that keeps the blood from clotting. All of the tubes have color coded ends to easily identify the plain and heparin treated tubes. If collecting anti-coagulated blood from a blood collection tube, use a plain capillary tube. If collecting by finger stick from a patient or when using untreated blood, use capillary tubes that are treated with an anticoagulant (heparin).